Everyone has a secret place, a quiet corner where the world slows down and life makes a little more sense. My solace is beneath a jasmine covered gazebo in the back garden. Under the leafy shade of this perfumed arch stands a wonky vintage table. I’m sure in a former life it bore witness to countless shared meals. In the summer we love to eat here, al fresco style, with chilled white wine and casual suppers. From early morning coffees through to Sunday lunches, this spot has become a peaceful haven of relaxation. 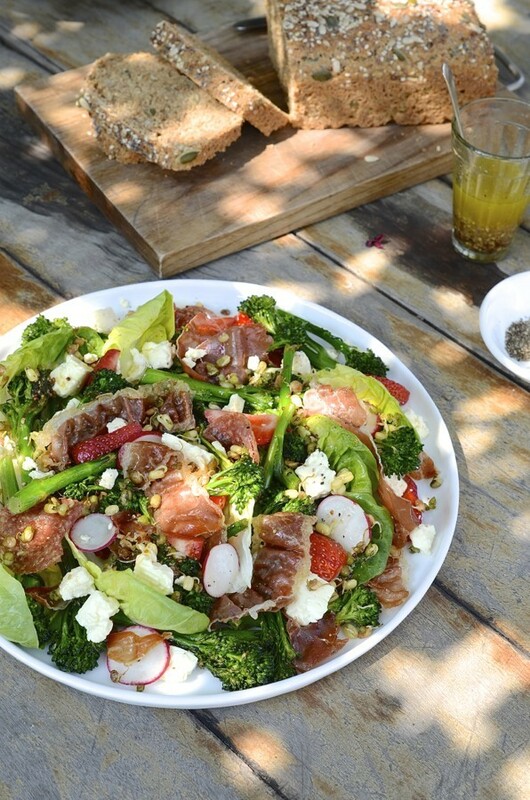 My prosciutto, strawberry and feta salad is the first summer salad to be enjoyed under the gazebo. Food just taste better when eaten outdoors. 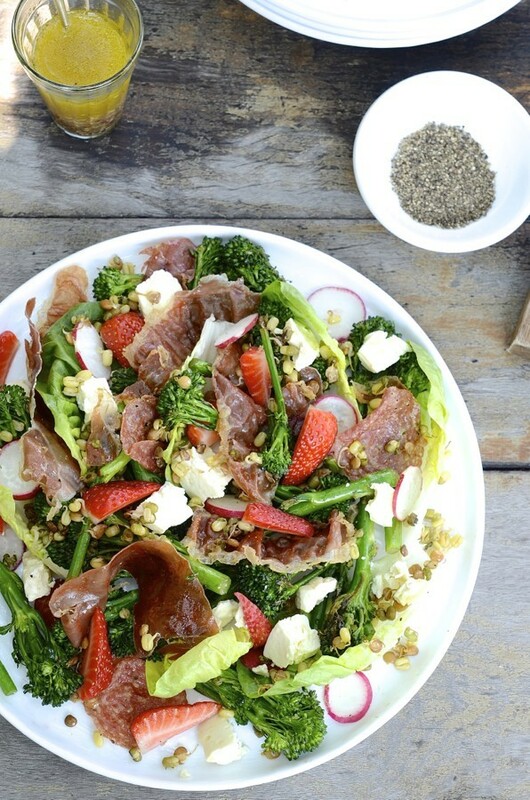 This salad has juicy strawberries, tender stemmed broccoli, prosciutto and nutty fried bean sprouts. Finished with a generous drizzle of honey and wholegrain mustard dressing, it encompasses all the things I love most about fresh eating. 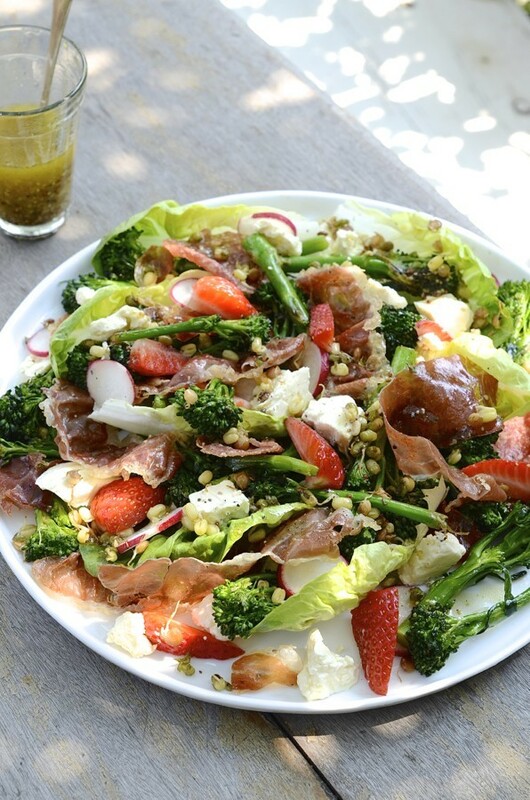 The wholegrain mustard and honey dressing is a good match with the fruit and salty elements in the salad. For additional texture, I’ve added pan-roasted bean sprouts and thin radish wafers. The blanched broccoli is flashed fried and infused with lemon and garlic oil. 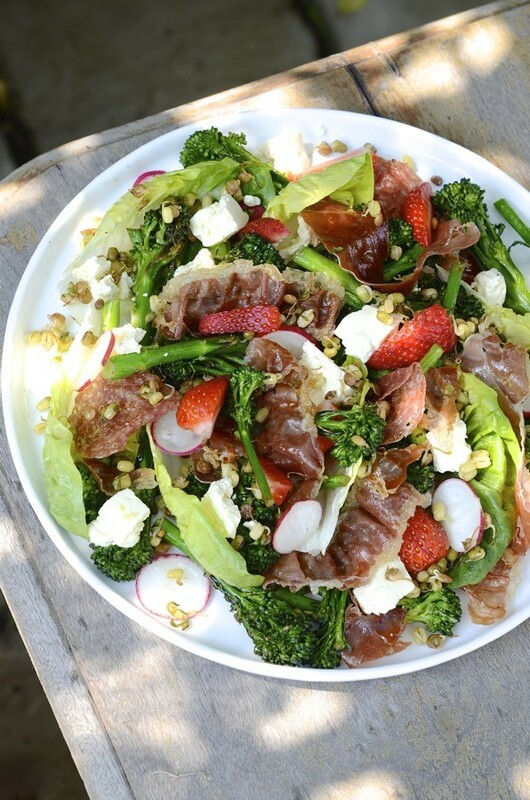 It transforms broccoli from just plain blah to yum! 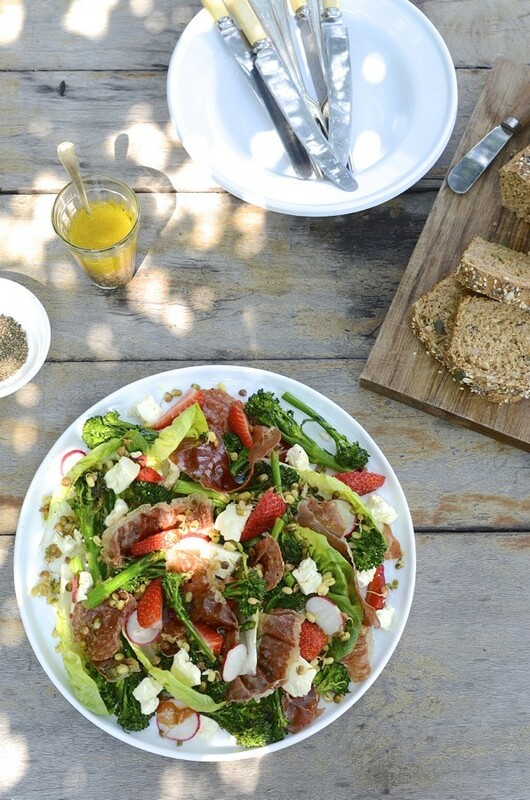 Creamy feta and strawberries are a current favourite combination of mine. Prosciutto is deliciously salty with a subtle sweetness which you can substitute with either parma ham or smoked bacon if you prefer. Just remember it needs to be pan fried or grilled until crisp. There’s just nothing about this salad that’s not exciting. I serve it as is but, if you need something a little more substantial to fill a gap, serve with a wholegrain seeded loaf. Fill a saucepan 2/3 of the way up with water and 1 teaspoon salt. Bring the water up to the boil. Add the broccoli stems and boil rapidly for 3 minutes. Remove the broccoli and plunge into a bowl of ice water. This will help to retain a vibrant green colour and stop the cooking process. When the broccoli is cool, drain thoroughly. Heat a drop of olive oil in a frying pan and brown the prosciutto on both sides until crisp. It literally takes 2 minutes. Drain on paper towelling. In the same pan, add the bean sprouts and fry for several minutes until nutty and slightly softened. Season lightly with salt and pepper. Remove from the pan and set aside to cool. Add 1 tablespoon olive oil to the frying pan and heat until hot. Toss the broccoli, garlic and lemon zest into the pan and fry for 2 minutes. Remove the garlic clove and season with salt and black pepper. For the dressing, place all the ingredients in jam jar and shake together. To plate, lay a bed of lettuce on a serving platter, top with the remaining ingredients, drizzle with the dressing and serve immediately. 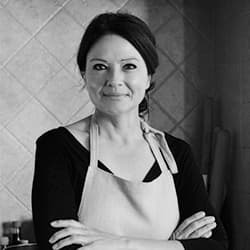 This salad was inspired by Monique Lane from Delicious magazine. Pleasure Antoinette. Must say, I love the strawberries and cheese. Also nice as a summer starter. Sometimes I think I might run out of words for food and then, they’re there. Thank you Gill!